Product description: Jaannisar Akhtar (Ek Jawan Maut) is written by Nida fazli and published by . 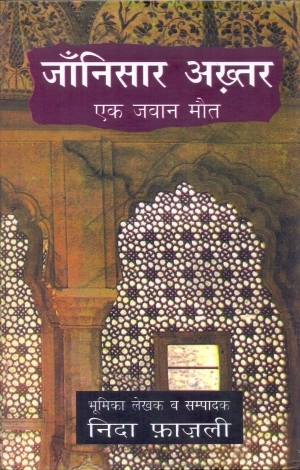 Buy Jaannisar Akhtar (Ek Jawan Maut) by Nida fazli from markmybook.com. An online bokstore for all kind of fiction, non fiction books and novels of English, Hindi & other Indian Languages. जाँनिसार अख़्तर एक बोहेमियन शायर थे. अगर ये कहा जाए कि तरक्कीपसंद शायरी के स्तंभ कहे जाने के बावजूद वो बुनियादी तौर पर एक रूमानी लहजे के शायर थे तो शायद गलत नहीं होगा.